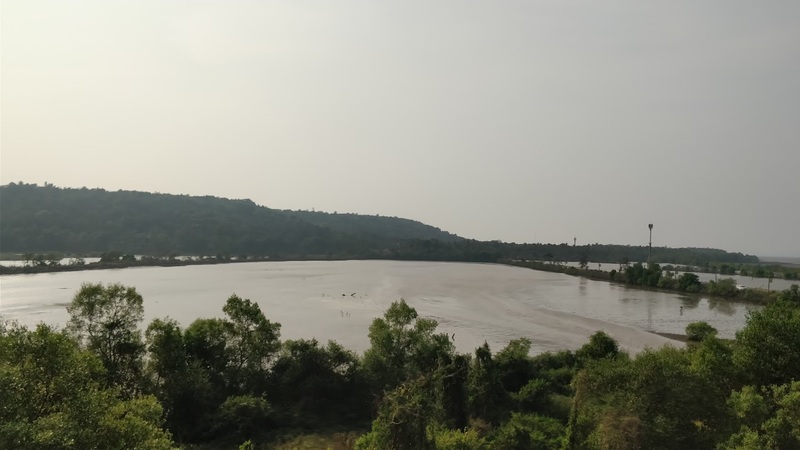 We left Benaulim by getting a taxi to Madgaon Station and then a 45-min train up to Thivim which is in North Goa and is quite a scenic journey with hills and lakes. Then it was a 40-min taxi journey to our next guest house. Banyan Soul was our home for the next 4 days, and it was lovely. Situated in a quiet part of town, about 10-15 min walk from the main beach and most of the beach shacks and restaurants. The staff were helpful, and with only 12 rooms it felt very relaxing and we could easily have here stayed longer. Pretty much right next door was the famous German Bakery, which is a very chilled café/bar serving delicious food. I think we ate here for breakfast 3 times and dinner twice and every meal was great, and they took card payments as well which is a bit of a rarity around here. Set in a shady wooded area, with great tunes and good service, it’s well worth a visit if you are in the area. We took a walk down to the beach on our first night, starting at the infamous Curlies Beach Shack where we watched sunset from. 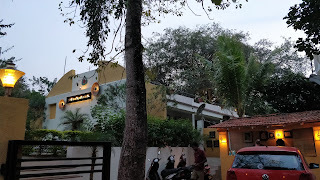 Despite the good psytrance music playing, the cocktails we ordered were horrible, so we quickly left and headed for another one of Anjunas famous bars, Café Lilliput. Sadly, the music was terrible and the price of drinks clearly raised by up to 50% on average, we didn’t stay here long either and headed back to the German Bakery. Our second day in Anjuna was just a lazy day chilling out at the guest house most of the day, then we went out into town early evening. 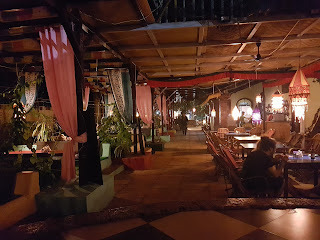 We headed to Sunset Bar which was recommended in a blog of the area by a local, and thankfully it was a much nicer atmosphere and back to normal prices for drinks. We then went to a few more bars, one of which called Gura is one of the oldest bars in the area, which also has live music though we didn’t stay long. After a few of the local 8% beers, we stumbled up to the main part of town to find the ATM, and went for dinner at a place called Eatopia. We then had an interesting journey back to the room, it all got a little messy! We both got pretty drunk the previous night, so when we had agreed to hire scooters for the last 2 days in Anjuna, we didn’t use them at all till later in the day. Sadie has never ridden a moped before, so initially we kept to the smaller, quieter side roads. On the hunt for petrol though, we ended up on one of the busier roads, and at a roundabout, the local police decided to pull both of us over! He wanted to see our licences, which of course we both had and we also had our International Driving Permits too, but he didn’t seem interested in them. He was however more interested in us not wearing helmets, and despite all the locals who also drive without then, he then tried to fine us for not wearing them. Initially he said the fine was 600 rupees each, however when I explained I had no money on me (I did but wasn’t telling him that), he then changed it to 500 rupees for both of us. 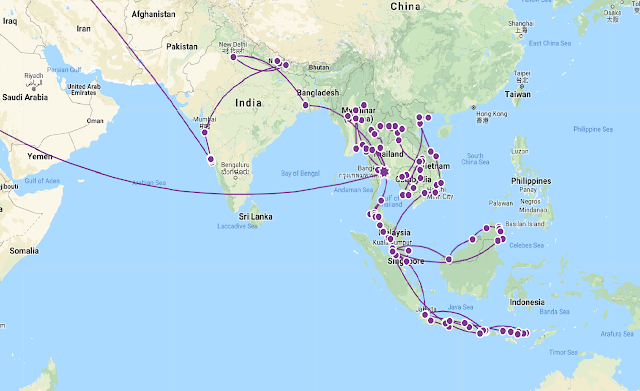 Having read about this and been advised by friends, they are just corrupt police trying to scam tourists, so 2 can play at that game and I told him I would go to the ATM and get his money and bring it back in 10 minutes…. And we promptly drove off never to see him again! We stopped at a bar on the outskirts of town, and accidently ended up next to the Saturday Night Bazaar at Arpora, where we planned to go to in the evening. Then we decided to take the mopeds back to the accommodation, and walk back as we wanted a few drinks. It was a lengthy walk of around 45 mins, and took a bit longer as a dog decided to follow us through the wooded area and after a little while where it wouldn’t go away, Sadie decided she needed to walk it back a bit as the dogs here are very territorial and as we passed a house with 2 vicious looking dogs, she didn’t want anything happen to it. 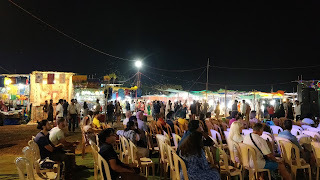 We got to the market, where live music was being played, fire dancers, lots of clothes, jewellery, spice and other local stuff were in abundance, along with a food court area, it felt very like being at a festival back home, but in very hot/humid conditions. Sadly, I have not been feeling well for a few days, and with what now seems like a chest infection, we didn’t stay as long as expected, and got a taxi back to the German Bakery where we had some late night food and then went to bed fairly early. 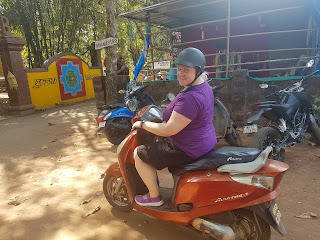 For our last day in Anjuna, we got up early and went out on the mopeds again. Heading south this time, we went down the coast through Baga and Calungate, where we stopped to have a look at the beach, as had been told it was very busy compared to the places we had stayed at. We originally were going to stay here, and thankfully it looks like we made the right decision as the beach was crowded and you could hardly see the water through the hideous number of sunbeds. Picking a shack for breakfast and a drink, which was lovely but I wouldn’t have liked to stay much longer. 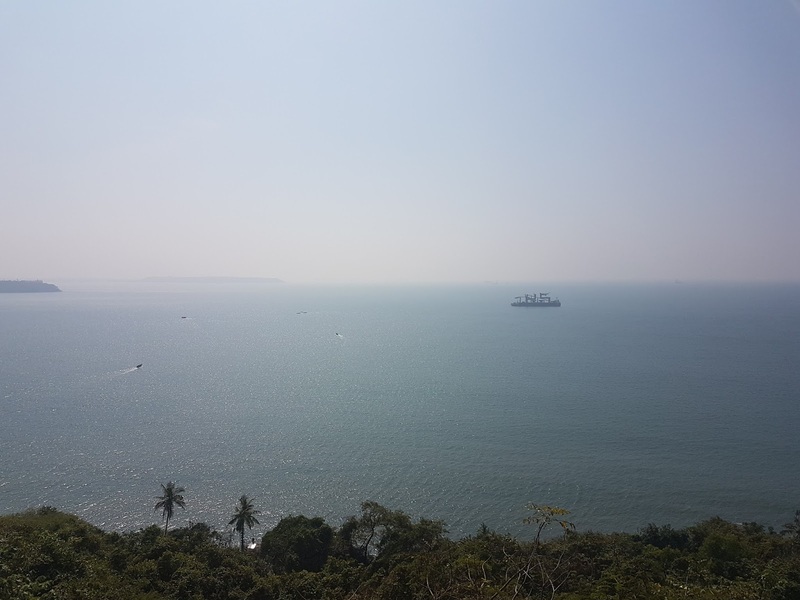 Continuing through Candolim and ending up at Aguada Fort which is a 17th century Portuguese Fort, it sat on top of a hill which gave beautiful views over the Arabian Sea and surrounding area. We’re trying not to mention/post photos of our food on this adventure, but this place does really deserve a mention, as this evening we decided to try a local restaurant called Goas Ark, which is highly rated on Trip Advisor and the temptation of them doing beef was too much, after not having any for 2 weeks! Sadie also got tempted by a nice bottle of red wine, whilst I pushed the boat out and had a few Budweisers instead of the usual Kingfisher! We had a hummus and pitta bread starter, which was the best tasting dish of hummus I have ever had, and having been well mentioned in the reviews on TripAdvisor, they even call their Wi-Fi network ‘Best Hummus’. We were then given a complimentary course of a salad with some sweet potato and yet more pitta. For main, we ordered the BBQ Beef Skewer and Beef Fillet Mignon, which both came with 2 sides so we got French fries, Israeli Salad, Vegetable Skewer and Coleslaw. There was so much food, and with them giving us 2 big fillets (yet only charged for one), we were both stuffed after all that, but everything was delicious and the beef cooked perfectly rare as requested. And all that for around £37! 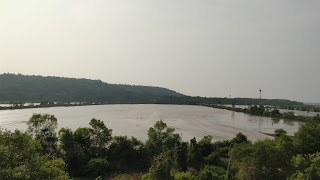 Overall, a very enjoyable time was had by us both in Anjuna, but next stop is the Jungle Hostel just a few kilometres north in the town of Vagator for 3 nights, our first hostel of this trip.